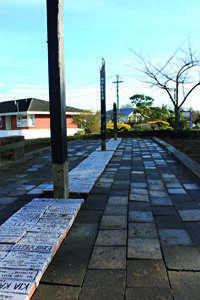 A photograph of bricks laid as a pathway in Churchill Park. 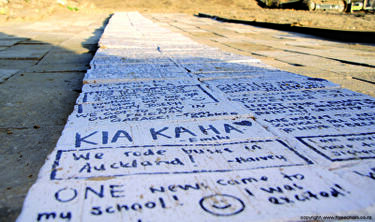 Each brick has a message written on it. A PDF copy of pages 212-213 of the book Christchurch: The Transitional City Pt IV. 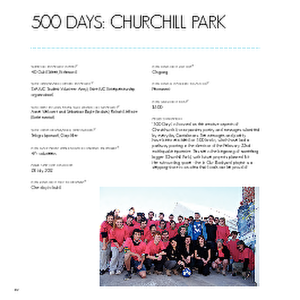 The pages document the transitional project '500 Days: Churchill Park'. Peter Walker, Three Chairs Photography. With permission from Volunteer Army Foundation. 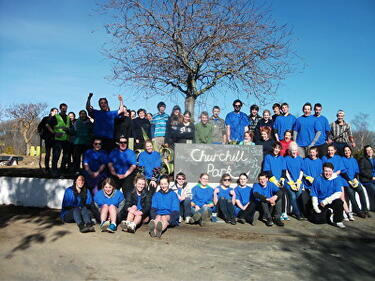 A photograph of students from the Student Volunteer Army and Entré with University of Canterbury Vice-Chancellor Rod Carr. 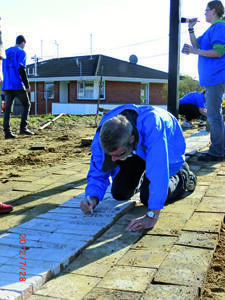 A photograph of University of Canterbury Vice-Chancellor Rod Carr writing a message on a brick pathway in Churchill Park.